I frequently speak with attorneys who are only too eager to hand over their log-in credentials for the Google Analytics account. Once you’ve finished sharing this data with me, you’ll have to change your password; otherwise I’ll have ongoing access. This is easy to do, but few ever consider it. Most law firms don’t run their email through google and because you must use a Google Account to access Google Analytics, many of the log-ins are personal google email accounts. (While you can associate a non Google email address with your Google Account, very few do.) Sending me over your personal account to log in to your company’s Google Analytics account means I can now read your personal gmail . . . If this is the primary business account (either a solo lawyer or the marketing department), the log-in also opens up access to Google Webmaster Tools, Google Adwords etc. By default your account probably has administrator access – which means you can add and delete users as you see fit. Now that you’ve sent me your credentials, so can I. 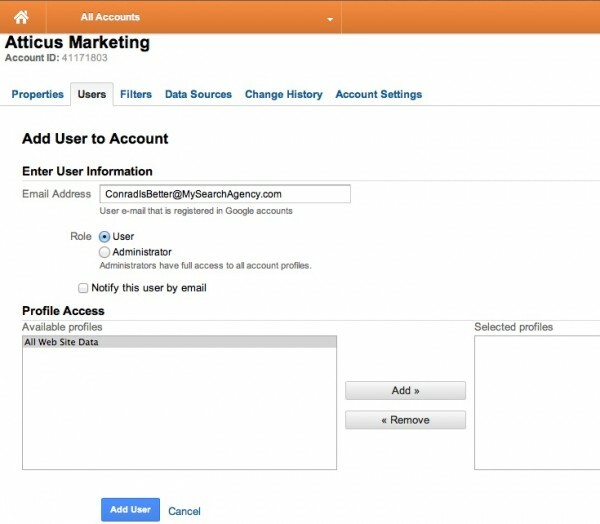 Note that if you rely on your agency to set up Google Analytics for you THEY will have your administrator level access. This is something you should check and change immediately if it is the case. (I’ll show you below how you can tell if this is the case.) Demand your agency make you the sole administrator and then grant them “user” level access. What does this look like in the real world? Recently, I transitioned a client (who will remain nameless) from their existing agency (who will also remain nameless) to Atticus. When reviewing the client’s Google Analtyics account, we discovered that a new, innocuous sounding administrator-level account (marketing@example.com) was created just prior to the switch. My client swears that she not only didn’t create it but wouldn’t know how to. Add a User with “User” Permissions. Note that you can get more complex with what people can and can’t see – if you want to explore, here’s the Google Documentation.